Special tuning makes the Pulmonica easy to play without a musical background. Wind instruments, especially harmonicas, have long been known to promote belly breathing (also referred to as abdominal or diaphragmatic breathing), but not everyone can learn to play a wind instrument. Long, slow, deep, and complete breathing is all that is needed for a Pulmonica. See our Program page for detailed directions on use and care. Where Can I Learn More about the Pulmonica? Where Can I Buy a Pulmonica? For quantities, use our Contact page or call us at 888-382-9283. What comes with the Pulmonica? The Pulmonica, a leather carrying case, a cleaning cloth, instructions for use and care, all neatly bundled in the box. 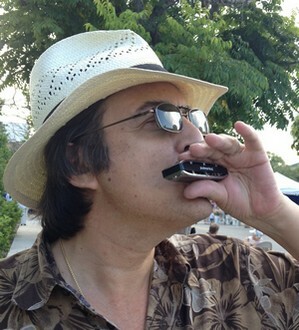 For every twenty Pulmonicas sold, Harmonica Techs will donate one to a charity to distribute to needy clients. Our first charity is the Senior Friendship Center health clinic in Florida, which serves low-income older adults. We also sponsor research on our Pulmonary Harmonica and welcome inquiries on our Contact page. Hand-made in Germany by Seydel, the world’s oldest harmonica manufacturer, the Pulmonica is warranted for one full year against manufacturing and material defects. If purchased from Amazon, the Pulmonica is also covered by Amazon’s 30-day money-back guarantee.